Peacocks of Grantham Hall is a pouch that uses Liberty Print fabric, famous for its beautiful colors and intricate designs. The pattern of peacocks sitting on a lawn was drawn by actor and producer John Malkovich. Peacocks of Grantham Hall was offered as a Weeks cover in the 2016 Hobonichi Techo lineup and was a big hit. The Small Drawer Pouch is the size of a long wallet and fits writing utensils, cards, charging cables, and other slim items. The pouch can lay open completely flat when it’s unzipped, making it easy to glance inside and grab what you need. Inside the pouch on the left are three pockets that can hold cards, rulers, scissors, and other flat objects. The pocket width can fit point cards and business cards. On the right side of the interior is an expandable mesh pocket that can hold items with more shape, such as pens, washi tape, charging cables, and more. Inside this pocket is a band that can hold a pens. On the outside of the pouch is a large pocket you can use to store pencils, tickets, or other items you want to have ready to grab. The pouch can hold many items, but its slim size and compact shape make it easy to fit into a purse or bag. 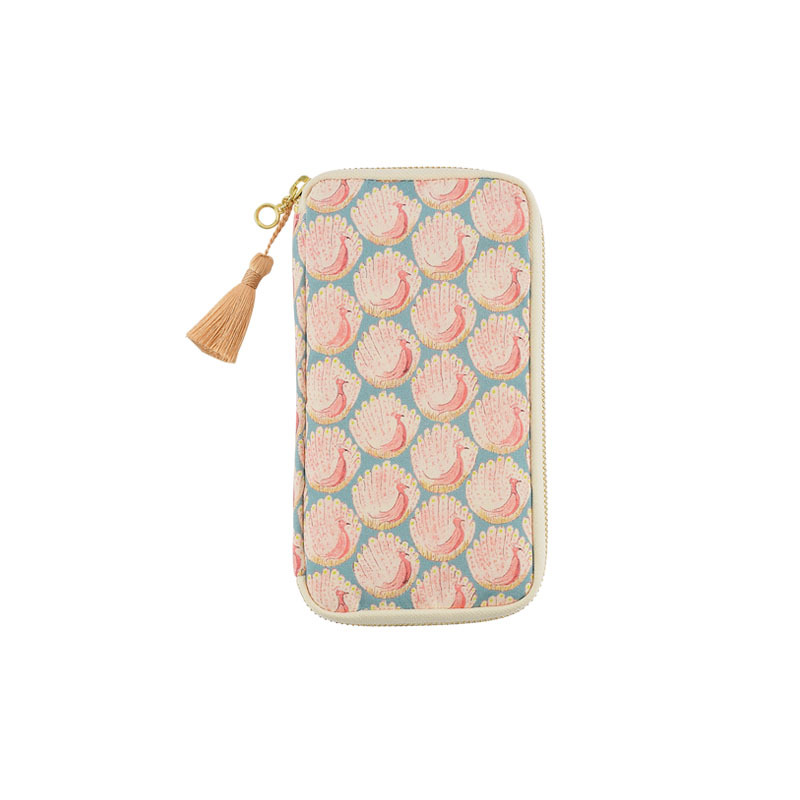 This pouch is the perfect place to securely store all your important items. You won’t have to spend time digging around your desk or the bottom of your bag when your checkbook, receipts, cards, or anything else you need is stored inside this cute little comrade. The pouch is perfect for holding pens and pencils, but it can also handle slightly bulkier items, like scissors and correction fluid. Because you can store everything you use in one compact case, it’s very handy to have around at work. Keep your sticky notes and washi tape stored in this pouch to have them on hand whenever you find yourself wanting to use them. The pouch is also great for storing receipts you’ll want to reference or use. This pouch can be a lifesaver at school when you use it as a versatile pen case. The pockets come in several different heights, making organizing a variety of different items convenient. If you like to draw, this is the case for you. You can fill it with pencils, crayons, a compass, erasers, or any other tools you use to make art. Here’s what the pouch would look like in the hands of an architect. You can use it to store other specialized tools, too—it makes an excellent toolbox or sewing kit. The portable pouch is an excellent carrying case for chargers, USB cables, earbuds, and other items to pair with your computer or smartphone. Stay organized on your camping trip or picnic by keeping your smaller outdoor items together in this pouch, such as a thermometer, bottle opener, or outdoor cutlery. The pouch makes a great makeup case. Use the array of pocket sizes to organize tools, and take advantage of the open-flat case to lay it out and see everything at once. W: 117 x H: 208 x T: 20 mm / W: 4.6" x H: 8.2" x T: 0.8"